Last week Dad (86) went to his first dentist appointment in eight years. His bill was $600! When I asked what procedures were done, he replied, “Nothing. 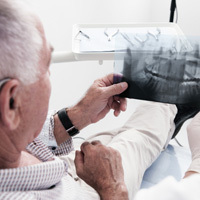 All he did was poke around in my mouth for a while.” Since when does an initial exam and x-rays cost $600?” Where can I report the dentist for taking advantage of a senior? It’s important to verify Dad’s report prior to filing a complaint. Call the dental office, explain Dad’s report, and ask for a copy of the visit record. If they refuse your request because of HIPAA (privacy) laws, put Dad on the phone to authorize the request. Our guess is the dentist did a great deal more than Dad reported and secured Dad’s permission prior to treating him. If so, then Dad needs an advocate at all medical/legal professionals to help him decipher his options. If the Dentist did behave unethically, file a complaint via phone (800-245-4339, log on to http://www.doh.state.fl.us/mqa/enforcement/enforce_csu.html or write Consumer Services, 4052 Bald Cypress Way, Bin C75, Tallahassee, FL 32399-3275.